All Original ! The previous owner of this toy truck used fabric tape on the inside of the canvas to prevent it from tearing further. C. Wheels roll freely. E. Steering wheel and front wheels turn as they should. 4 page catalog with great color illustration graphics. Featuring World famous Ride Em Steel toys, and Moviegraph. Airplane, steam shovel, steam roller, tractor, dump truck, train locomotive. SUPER RARE Advertising Trade Catalog / Large Brochure. VERY NICE 1920'S OR 1930'S KEYSTONE WATER TOWER FIRE TRUCK with WORKING LIGHTS WHEN TESTED. FRONT BRASS BELL. WATER PUMP WAS TESTED DURING RESTORATION AND WORKED I WAS TOLD. IN VERY GOOD CONDITION FOR IT'S AGE. 1920's 1930's Keystone Pressed Steel Toy Trucks Tires only. Set Of 4 The Size Is 4 1/2 Dia. See photo of the truck they fit. Truck not included. They Are Just Like The Original! 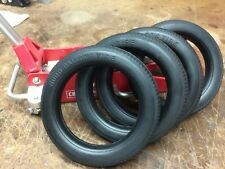 Real Rubber! They Are Mint! 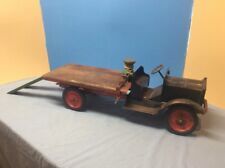 Very old Keystone pressed steel toy truck. THESE ARE EXCEPTIONAL HIGH QUALITY SELF ADHESIVE VINYL DECALS. NOT WATER TRANSFERS. MUCH EASIER TO APPLY. THESE WILL NOT FLOAT AWAY IN PIECES OR COLOR BLEED THROUGH AS THE WATER TRANSFER OFTEN DO WHEN APPLIED TO YOUR PROJECT. MADE TO ORIGINAL SIZE & COLOR. DIE CUT WITH NO TRIMMING NEEDED. This is a beautiful Keystone toy, styled as a Packard "U.S. Mail" Delivery Truck. Solid construction with impressive size and weight, and attractive cross-hatch pattern in the cargo area walls. 26” long 8.5” width 8.25” tall. This is local pick up only! Thx for looking. Rare 1920's Keystone Fire Truck. Missing water tank, ladder, and others items. It's been repainted back in the 60's. It's rough, but restored it could bring $1500. This truck is in solid condition. Missing part of its beacon light and water nozzle. 32” long 12” tall 8.5” width. 21” long 8.5” tall 6” width.